You can rest assured when you are here at Cypress Cove that you are in good hands. Thanks to an initiative set in motion by general manager Peter Sewall, all Cypress Cove employees are now 100% CPR certified. The instructor, Toni Griffis of Binghamton, NY, is a snowbird resident of the Cove and an Instructor Coordinator teaching EMTs & paramedics. She has worked in the medical field since 1961 and now owns and operates Medical Training Service, which teaches and certifies individuals in CPR and basic first aid. Employees had the month of January to sign up for the 2-hour class being offered on the Terrace. 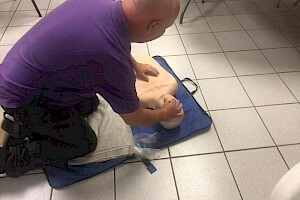 Participants learned how to stabilize blood sugar, dispense opioid inhibitors, conduct basic first aid, perform the Heimlich maneuver, and initiate CPR. Cypress Cove employee certification comes through ASHI (American Safety & Health Institute) and will be a 2-year certification. Cypress Cove security staff will be taking an additional 2- hour course through the local fire department for further certification. You’re in good hands at Cypress Cove. If you are interested in taking a class with Toni, she will be holding two classes for non-employees. These classes will be on February 5 and 11 from 11 am to 1 pm at Cypress Cove and will be $25 per person.